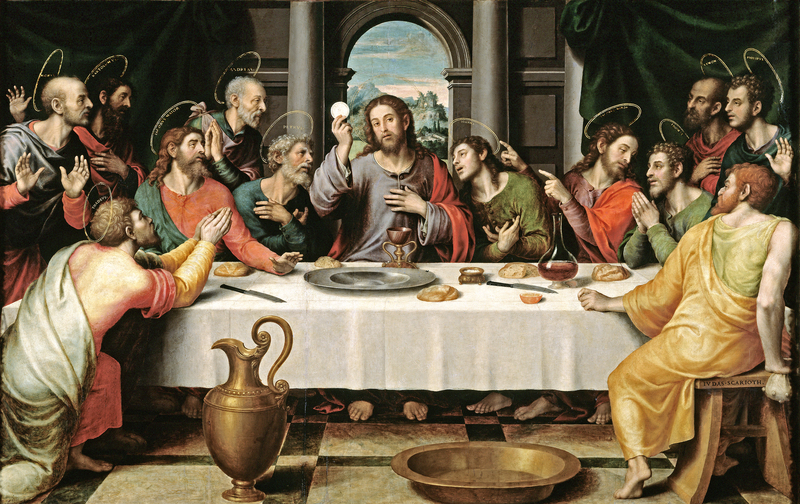 The Eucharist: Is the Real Presence Biblical? The "Real Presence" of Jesus in the Eucharist is rooted in Christ's own teachings. When Jesus taught about the Eucharist, he spoke with a profound realism. At the Last Supper, he didn't say, "This is a symbol of my body." He said, "This is my body…" And when he gave his most in-depth teaching on the Eucharist, he spoke in a very realistic way — in a way that makes clear that the Eucharist is not just a symbol of Jesus, but is his flesh and blood made sacramentally present. Let's enter into that dramatic scene, known as "The Bread of Life Discourse" in John's Gospel chapter six. Jesus had just performed his greatest miracle so far, multiplying loaves and fish to feed 5,000 people. The crowds are in awe. They declare him to be the great "prophet who is to come" and want to carry him off to make him king (John 6:14-15). But the very next day, Jesus says something that sends his public approval ratings plummeting, something that makes those same raving fans now oppose him. Even some of his own disciples will walk away from him. What does Jesus say that was so controversial? He taught about partaking of his body and blood in the Eucharist. Jesus first says, "I am the bread of life…the true bread come down from heaven" (John 6:35). And he makes clear that he is not bread in some vague, figurative sense. He concludes, "…and the bread which I shall give for the life of the world is my flesh" (John 6:51). The people are shocked at this. They say, "How can this man give us his flesh to eat?" (John 6:52). The Jews listening that day don't take Jesus as speaking metaphorically, as if we are to somehow only symbolically eat of his flesh. They understand Jesus very well. They know he is speaking realistically here, and that's why they are appalled. Now here's the key: Jesus has every opportunity to clarify his teaching. But notice how that's precisely what he doesn't do. He doesn't back up and say, "Oh wait…I'm sorry…You misunderstood. I was only speaking metaphorically here!" He doesn't soften his teaching, saying "You just need to nourish yourself on my teaching, my wisdom, my love." Jesus does just the opposite. He uses even more graphic, more intense language to drive his point home: "Truly, truly, I say to you, unless you eat the flesh of the Son of man and drink his blood, you have no life in you" (John 6:53). And he goes on to underscore how essential partaking of his body and blood is for our salvation. "He who eats my flesh and drinks my blood has eternal life, and I will raise him up at the last day. For my flesh is food indeed, and my blood is drink indeed. He who eats my flesh and drinks my blood abides in me, and I in him" (6:54-55). In fact, Jesus now uses a word for "eat" that has even greater graphic intensity — trogein, which means to chew or gnaw — not a word that would be used figuratively here! This is not the language of someone speaking metaphorically. Jesus wants to give us his very body and blood in the Eucharist. In fact, Jesus now uses a word for "eat" that has even greater graphic intensity — trogein, which means to chew or gnaw — not a word that would be used figuratively here! So challenging is this teaching that even many of Christ's disciples are bewildered, saying "This is a hard saying; who can listen to it?" (John 6:60). Indeed, Christ's words on the Eucharist were too much for some of them to believe. Many of his disciples rejected Jesus over this teaching and left him (John 6:66). And Jesus let them go. He didn't chase after them, saying, "Wait! You misunderstood me." They understood quite well that Jesus was speaking about eating his flesh and blood, and they rejected this teaching. That's why Jesus let them go. So it's clear that Jesus wants to give us his Body and Blood in the Eucharist. But we still must ask, why? In the Jewish, Biblical worldview of Jesus' day, the body is an expression of the whole person and the life is in the blood. So by giving us his Body and Blood in the Eucharist, Jesus is giving his very life to us, and he wants to unite himself to us in the most intimate way possible. He wants to fill us with his life and heal us of our wounds, strengthen us in his love change us to become more and more like him. That's the life-transforming power of the Eucharist in our lives. In Holy Communion, we have the most profound union with Our Lord Jesus Christ that we can have here on earth. See part one in this series "Did Jesus Really Want us to Eat His Body?" Edward Sri. "The Eucharist: Is the Real Presence Biblical?" Edward Sri blog (December 28, 2014). Reprinted with permission of Edward Sri.